Preserving Old Life…Breathing New Life. I love adaptive reuse…of anything. I first came across the term while studying architecture. In that sense it’s taking a building used for one purpose and using it for another. Abandoned factories can be turned into apartment lofts, or church sanctuaries into restaurants. The possibilities are endless. I originally loved these projects for their unique architectural spaces and details. Having historic materials like railroad ties, contrasted with chic metal or glass in your living room creates visual interest wherever you look. Of course reuse can be applied to anything. For our recent anniversary my husband got me a ring that was made out of a silver sugar spoon handle. This practice was originally done in Victorian England by servants who stole silverware from their employers because they couldn’t afford wedding rings. Creative, huh? It is clearly understood in the architecture community that adaptive reuse is very environmentally sustainable. The reuse of buildings prevents the large amount of CO2 that is emitted during demolition. Of course it also preserves the destruction of raw materials that would be used to build a new structure, along with the fossil fuels used to transport them. However, in my architectural education the other very positive benefits were barely mentioned. The adaptive reuse of buildings, especially those that hold a very significant place in the identity of a city, contribute massively to the place-making of neighborhoods and communities. It’s always heartbreaking for me to see buildings that are so loved by people imploded. Perhaps it’s because I’ve been someone who’s always placed a great deal of importance on my physical surroundings. When I moved from my childhood home at the age of 16, it was the first big loss I had experienced in my life. I came across the demolition of the Old St. Louis Arena in 1999, while I studied in St. Louis. “The Old Barn” was the term St. Louisians called it during its 65 years of housing events for the community, including sporting events, concerts, the circus. For 27 years it hosted the St. Louis Blues, the NHL hockey team. It’s closing sparked months and months of protesting to prevent its demolition. People shared their memories of the building, hoping that collectively the communities love could save it. They couldn’t. On February 27, 1999 thousands of people went to watch it be imploded. In a poor attempt to try to make it a celebration, the developer set off fireworks. For many, it was a funeral. I often think about what that building could have become. Of course it was economically unfeasible for the St. Louis Blues to continue to play there, but the beautiful example of Art Deco architecture surely could have lived on as a concert hall or an entertainment complex where people could have continued to make it part of their lives. Unfortunately, no remnants of the site’s history or its landmark status remains. Now it is this…an office park. Much loved? Probably not. Of course this post can be viewed as unrealistic or unaware of development, progress, and economic feasibility. Adaptive reuse is not always a marketable or feasible option. But I choose, in this post at least, to remember those special places that mean so much to each and every one of us. 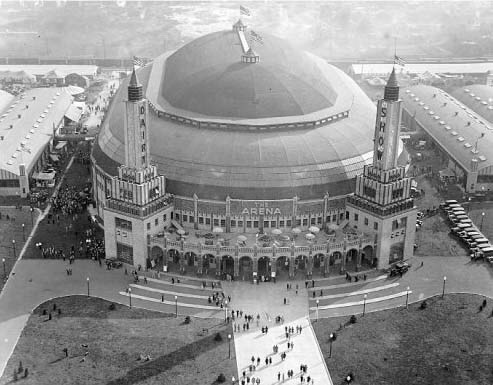 In the case of the St. Louis Arena, its adaptive reuse, while not immediately economically feasible, could have been more economically sustainable in the long run. Creating unique and emotionally significant structures, where people want to spend more time, and therefore are more economically valuable, becomes more challenging every day. The question for me is: how long will that office park last, and when it is torn down will anyone try to save it?